A Letter of Resignation starts the formal process of leaving the employment of a company. For the most part, these letters are simple and to the point. Our forms can help you make your Resignation Letter easily within minutes. You want to let your employer know that you are leaving their employment and when. Your employer asks for a written notice of your voluntary resignation. You want a written record that you notified your employer that you were leaving your job. While not all companies require you to submit a formal Resignation Letter, it can be a way to communicate your departure in a positive manner and to relate when you expect to leave your position. You can quickly make your Letter to Quit using this document builder. A Resignation Letter is simply a letter stating that an employee is planning to leave their current employment. Some may call it "tendering your resignation" or the written statement may be called a Letter to Quit, either way it just means an employee is letting the company know that they are planning to leave their job and when they plan their last day of work to be. While it is not usually required, most submit this letter two weeks before they plan to leave. When it comes to letters of resignations, the briefer the better. You do not want to offer too much information such as what company you may work for next or why you are leaving. It is best to keep it simple and positive. You do not want to burn bridges or highlight company issues in this letter. It is simply a formality and a way for you and the company to document your voluntary departure from the company. Besides the basic form information, you only need to include two things in your resignation letter: that you are leaving the company and when. Can you email your resignation? You can submit a printed copy or submit by email, or both. Either way, keep a copy for your own records. If your end date changes, make sure to alter the letter and resubmit it. You only need to submit the letter to the appropriate person, you should not CC it to coworkers or other managers if not necessary. Can my company fire me after I give notice? Be prepared because in many states they can. Some states are "employed at will" or "right to work" states, sometimes nicknamed "right to fire" states by employees, which means they can let you go from the company without a reason. In some cases, they may ask you to voluntarily leave so they can avoid paying unemployment. You may be protected if you have an employment contract or are part of a union. You may also experience leniency if you are considered a protected class. Some states may override a company's "at will" policies. However, be prepared to leave your company after you submit your notice just in case. It is recommended that you should be ready to be escorted out of the building. Make sure you discreetly remove personal information from your company-owned computers and devices before handing in your notice. They may not fire you instantly, but it is best to be prepared. Many companies are perfectly fine with allowing you to work until your quit date without issues. If serious problems arise you may benefit from consulting with an employment attorney. When should I give notice that I am leaving my job? It depends. If you think you might be let go as soon as you submit notice, you may want to wait as long as possible if you cannot afford to go without income until your next job starts. The standard time to give notice is two weeks before your planned last day of work. If you feel you have a good working relationship and you think your employer will want you to train your replacement, then you may want to submit a full two weeks in advance. Either way, be prepared to be dismissed from your job when you submit your notice just in case. What should I do before I leave my job? It is best to leave on good terms. If you are allowed to work your last two weeks or longer, do what you can to help your team transition. You may be tasked with training your replacement or with building training materials for your job. Make sure that you continue to work hard until your leave date and try not to discuss your new position with your coworkers too often. Show your appreciation to your company and express positive thoughts to your managers, mentors and coworkers. It doesn't help you to leave on bad terms and you may need Recommendation Letters and reviews from your coworkers and managers later. Also talk to human resources about pay owed such as vacation and accrued time, 401K rollover options, healthcare insurance COBRA options and more. What should I do after I leave my job? There are few things you can do to help you move forward in your career between companies. The first thing to do before you forget is to write out a description of your previous job and your accomplishments. Next politely ask your previous managers and coworkers for recommendations for your online profile. Make sure that you honor any Non-disclosure Agreements you may still be bound to. If you have any proprietary information from your previous computer on your personal computer or devices, dispose of it properly. If you are an employer and an employee is leaving your company, you may be wondering: What happens when an employee quits my business? 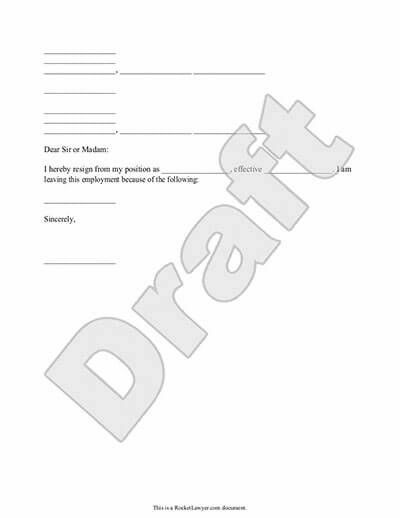 Our step-by-step interview process makes creating a printable Letter of Resignation easy.